What Is I Ching Hexagram 31 All About? 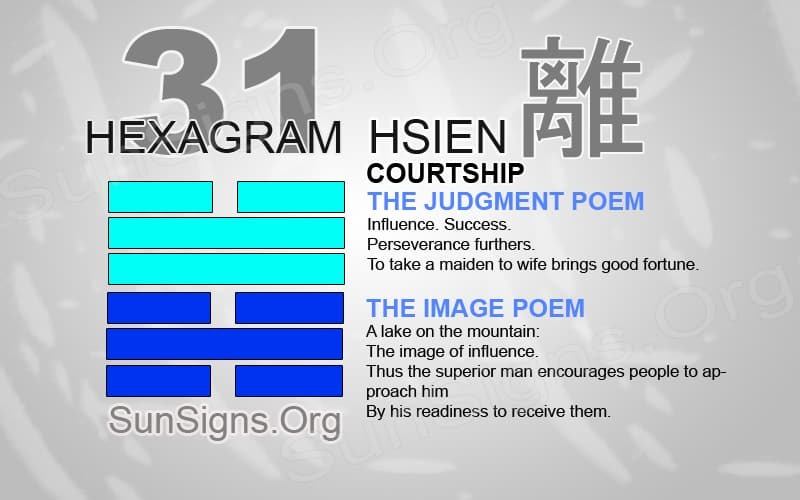 Hsien is the Chinese name of the I Ching Hexagram 31. This has inner and outer trigrams forming lake over mountain. People call this Hexagram ‘courtship’ or ‘conjoining’ or ‘influence’. Hexagram 31 divination often speaks on a romantic note about finding a partner with similar strengths and qualities. A partnership is important, whether it is romantic or in a business setting, seeking someone that will be complementary is ideal. To enjoy life to the fullest, we must do so by interacting with others. By finding people with similar interests, you can strengthen and ensure your joy. There are many reasons why we seek someone out. Hexagram 31 divination advises finding people that will be complementary to your own strengthens and abilities. It can be to find a life partner or a business partner to help build up a business. If someone appears to be too good to be real, then often enough, the situation is only troublesome. There is no perfect person in the world. But, some people will complement you instead of trying to change you into something else. Dangerous feelings such as lust and envy can sometimes overcome the mind. And, it affects the rational processes used to determine if a situation is good or bad. Safeguard from those who like to prey on the open-minded, and more importantly, the open-hearted. Continuously seek aspects of life that will lift and inspire you to be better and accomplish more. There are things in life that will help aid you. And, then some people will only want to change you into something else. Find those things that match what you are already trying to do and will bring balance into your life. Have fun when searching for new people to add to your life. But, make sure they will be able to help and not hinder your progression. Hexagram 31 yijing pertains mostly to the love relationships. We might be starting on a new adventure to find a life partner. Then, it is ideal to find those who have similar interests. When enjoying activities in the community, observe who is also there. Someone might be willing to try similar events in the future with you. This is an easy start to finding people who might be the perfect match. Therefore, it can take time to discover a person’s qualities. But, that only means that you need to have continuous interaction. Enjoy the time to discover someone new. Understand their strengths and weaknesses. It is often easy to be swept away by a person’s beauty over there straight appearance and abilities. It is important not to jump into a relationship without taking the proper time to truly discover a person. Also, I Ching 31 says that looking to hire associates or bring into a business a new partner can be important. It’s important to find someone with the same work ethics and dedication to working hard as the person who manages the business. When working with people who don’t have similar perspectives or working habits, success is then improbable. Co-workers may have different personalities. Try out co-worker compatibility. But, without mutual respect for each other, there is a tiny chance for progress in work. Instead, seek out those who will be a perfect match for the job. They must be willing to work with others to do a difficult job. Hexagram 31 says be willing to work with many different types of people but make sure to have mutual respect for everyone. Also, we must treat everyone with the same kindness even if we have different views and morals in life. Not everyone will see the life the same as we do. That is why it is important to be helpful to all types of people.